As soon as the sanskrit verses start, I certainly predicate that the song is going to be a cult hit like Dabbang and Omkaara title tracks.But as soon as Sukhwinder Singh starts rendering mesmerizing tune, I simply feel overpowered and energetic. Theme (Music and Lyrics) of the track is just omnipotent. Music is a very well fusion of violins, Dhols and Flute. The song never loses energy level, even in the interlude. A very well use of chorus is made throughout the song. Music is thus very innovative. I feel glad to see Ajay-Atul on the cover (I still remember Hanuman Chalisa from Waah! Life Ho to Aisi) and last 45 seconds of the song just enthrall me into the new divines!! It’s a real good start to the album. 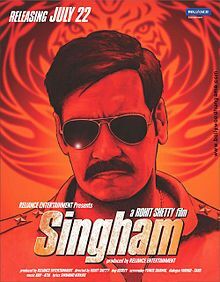 Ave Singham!! The song seems ordinary at first listen. Sounds meliorate on the next and superlative on the next to next! The track is distinguished from ordinary ones by use of violins (again! ), very Indianised instruments (like Matka) and singing of the male lead. The male lead, Ajay Gogavale, who happens to be the one from music director duo,is just splendid. The voice texture in the voice gives his solo singing, a chorus feel!! Shreya Ghoshal is apt for the song and lyrics fill up the bill. Well, after brilliant first two songs, this one is a mediocre. The lyrics are beautiful, tune is ordinary and singing is good. Its a long time since I heard from Kunal Ganjawala. Music is not innovative here like the previous two. An average track. And surprisingly, all the originals come to an end here. Rohit Shetty likes to serve more songs but this time I am little disappointed with only three originals on the cover. Ajay – Atul definitely makes good music for first two tracks, and if they could serve some more variety in genres, It would have been easier to rate the album. Never mind, I rate this album a lenient three out of five for its two super hit tracks.